Our family has taken quite a few cruises over the years and I am always amazed at how often folks pay big bucks for excursions through the cruise line companies. This is a key source of revenue for cruise companies, but not really necessary for most ports. Our last trip was a good example. We were on a Scandinavian cruise and porting for the day in lovely Copenhagen, Denmark. The cruise company had a 8 or 10 different excursions available (which they encouraged people to book early or be left out). Almost all of them had some element of a coach ride through town to see the town, and they cost between $65-$125 per person. That’s $195-$375 for our family of three. Instead, we walked from the pier into the city with a basic map and only a rough idea of where we were headed. Nonetheless, we saw the Little Mermaid statue on the harbor, the changing of the guard at the Royal Palace, a beautiful round Renaissance church, the main shopping & walking district, and finished at the amazing Tivoli Gardens. We didn’t always know exactly where we were at (how far to Tivoli Gardens? ), and once we took a wrong turn once (ending up at a wonderful bakery). That said, the whole time we walked by motor coaches filled with bored looking tourists like us. Like us, except they were paying $$$ to be guided as a group. Some ports require you to take an excursion. When you stop in St. Petersburg, Russia you need to be part of a tour to have visa. Other cities are a far ride from the port and no practical transportation is available except through an excursion (Pompeii via Naples). I would bet that two-thirds of cities are easily explored on your own. 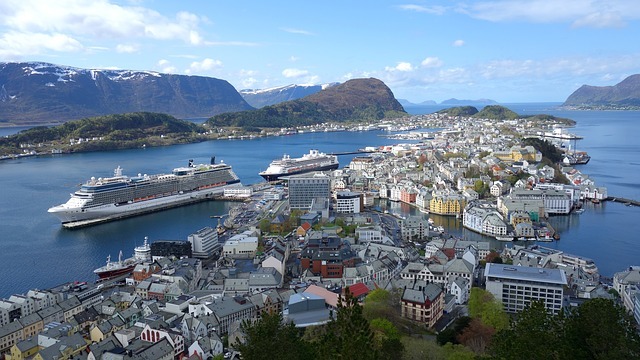 On this recent cruise, we organiz d our own visits in five of six ports. There is good self-guided tour advice in all of the Rick Steves books and on CruiseCritic.com.